Whether you hang one on your front door to spread holiday cheer around the neighborhood or use them as festive handmade decorations inside your home, Christmas wreaths are an essential part of any holiday decorating scheme. If you're feeling crafty and have a few spare moments, there are several different kinds of Christmas wreaths you can make to give as gifts or use to add holiday spirit to your own home. You can make an evergreen wreath for your front door using real evergreen boughs or artificial boughs from the craft store. 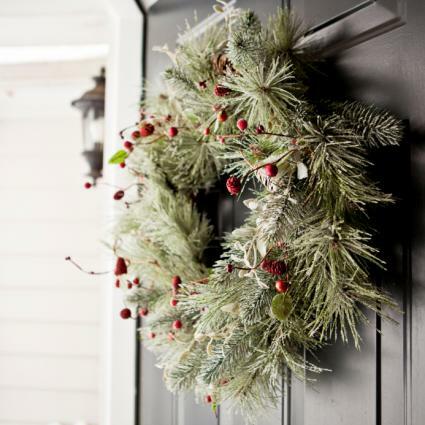 If you choose real evergreen boughs, you'll need to keep your wreath cool to avoid dropped needles inside your house. You can make this wreath in about an hour. Begin by clipping the evergreen boughs into small pieces, each about six to ten inches long. Gather several evergreen pieces into a bundle and tightly wrap florists' wire around the base. Mix the varieties of evergreen together to create each bundle, leaving an 18-inch tail of wire on each one. You'll need about 18 bundles, but you can make more or less depending on your desired fullness. Place the wire wreath form on your work surface. Lay one bundle on top so that the wrapped ends are resting on the wreath form and the evergreen ends are coming off the form at about a 30-degree angle. Wrap the wire tail around the wreath form to secure the evergreen pieces. Place another bundle on the wreath form so that the evergreen ends cover the wrapped area of the previous bundle. Secure it with the wire, and repeat with the remaining bundle until the entire wreath is covered. Add the floral berries to the wreath, using florists' wire to secure them. Create a hanging loop on the back of the wreath using more florists' wire. In a well-ventilated area, spray the entire wreath very lightly with spray adhesive. Sprinkle glitter on it to give a frosted effect. Allow the glue to dry, and then hang the wreath on your front door. Grapevine wreaths are easy to make, and they provide a festive touch indoors and out. If you'll be using your wreath inside, use artificial evergreen pieces. These wreaths also make great gifts for teachers, friends, and family. This simple project will take you less than an hour. Trim the artificial evergreen and foliage pieces to about eight inches. Gather them into small bundles, and use florists' wire to bind the ends together. Leave a 12-inch wire tail on each bundle. You'll need about six small bundles. Thread the wire tail of one bundle through the branches of the grapevine wreath form, and wrap the wire around the branch to secure it. Repeat with the remaining bundles so you have three bundles going each direction from the center. Adjust the angle so there is a full evergreen area to use as a decorating base. Wrap a piece of florists' wire around the bottom of one pinecone, leaving long tails for securing it to the wreath. Repeat with additional pinecones. You'll need about four total. 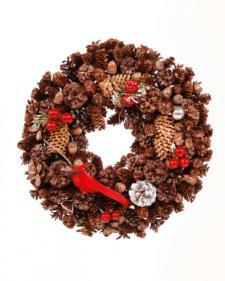 Use the wire tails to attach each pinecone to the wreath as desired. Add the floral berries using more florists' wire. Make a bow out of the plaid ribbon, leaving the ends as long or short as you desire. Use florists' wire to attach the bow to the middle of the evergreen area, covering any exposed wire. Use additional wire to attach a Christmas ornament over the bow. Create a wire hanging loop on the back of the wreath and display your creation. A red berry wreath makes a simple and fast project, and it's a lovely Christmas decoration for inside your house. You can even add small berry wreaths to the top of wrapped packages as holiday gift toppers. This easy wreath will take you about 30 minutes or less. Begin by wrapping the entire wreath ring in brown raffia. Securely tie the end, but don't cut it. 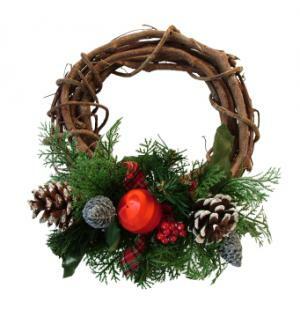 Place a sprig of red berries along the wreath ring, beginning next to the raffia end. Wrap the raffia around the stem of the sprig to secure it. Knot the raffia again, but don't cut it. Continue adding sprigs until you've covered the entire wreath ring as desired. Securely tie off the raffia and cut the end. Make a raffia hanging loop if desired. Make a bow of the glittery red ribbon. Use the raffia to tie it to the wreath as desired. A pinecone wreath makes a fun and festive holiday project for displaying indoors. The addition of red and white elements give it a Christmas flair without being over the top. This simple project will take about an hour and a half. Start by painting white edges on a few of the pinecones to simulate snow. Allow these to dry thoroughly. Wrap a piece of brown florists' wire around the wreath form to create a hanging loop on the back. Use the glue gun to attach a layer of pine cones to the front of the wreath form. Remove any excess glue, and allow the first layer to dry. When the first layer is dry, add another layer of pinecones. Mix the white-edged ones in randomly. Continue adding pinecones until you're content with the fullness of the wreath. Allow it to dry. 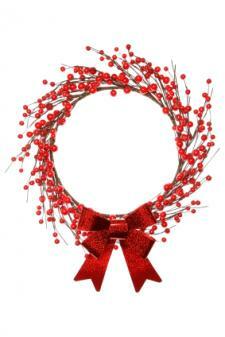 Use brown florists' wire to attach the red berries and cardinal. Tuck the wire ends under to hide them. If necessary, top with a few more small pine cones to disguise the wire. No matter which Christmas wreath you choose to make, you'll love seeing your handiwork displayed in your home during the holiday season. Feel free to add your own creative touches to each design or adjust the colors to match your holiday decorating scheme. Handmade Christmas decorations are all about expressing your holiday spirit and your creativity.